"No black knight in Sir Walter Scott's novels, nor the Indians of Cooper, nor his famous pioneer, Leather Stocking of the forest, nor his long Tom of the ocean, ever seemed more truly romantic than do Hawthorne's stern and gloomy Calvinists of The Scarlet Letter and The House of Seven Gables, or his Italian hero of The Marble Faun. 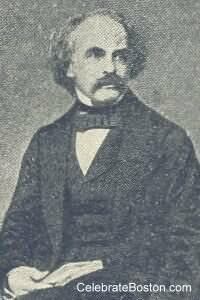 It was in the old town of Salem, Massachusetts—where his Puritan ancestors had lived for nearly two hundred years—with its haunted memories of witches and strange sea tales; its stories of Endicott and the Indians, and the somber traditions of witchcraft and Puritan persecution that Nathaniel Hawthorne was born July 4, 1804. And it was in this grim, ancient city by the sea that the life of the renowned romancer was greatly bound up. In his childhood the town was already falling to decay, and his lonely surroundings filled his young imagination with a weirdness that found expression in the books of his later life, and impressed upon his character a seriousness that clung to him ever after. His father was a sea-captain—but a most melancholy and silent man—who died when Nathaniel was four years old. His mother lived a sad and secluded life, and the boy thus early learned to exist in a strange and imaginative world of his own creation. So fond of seclusion did he become that even after his graduation from college in 1825, he returned to his old haunt at Salem and resumed his solitary, dreamy existence. For twelve years, from 1825 to 1837, he went nowhere, he saw no one; he worked in his room by day, reading and writing; at twilight he wandered out along the shore, or through the darkened streets of the town. Certainly this was no attractive life to most young men; but for Hawthorne it had its fascination and during this time he was storing his mind, forming his style, training his imagination and preparing for the splendid literary fame of his later years. Hawthorne received his early education in Salem, partly at the school of Joseph E. Worcester, the author of Worcester's Dictionary. He entered Bowdoin College in 1821. The poet, Longfellow, and John S. C. Abbott were his classmates; and Franklin Pierce—one class in advance of him—was his close friend. He graduated in 1825 without any special distinction. His first book, Fanshawe, a novel, was issued in 1826, but so poor was its success that he suppressed if further publication. Subsequently he placed the manuscript of a collection of stories in the hands of his publisher, but timidly withdrew and destroyed them. His first practical encouragement was received from Samuel G. Goodrich, who published four stories in the Token, one of the annuals of that time, in 1831. Mr. Goodrich also engaged Hawthorne as editor of the American Magazine of Useful and Entertaining Knowledge, which position he occupied from 1836 to 1838. About this time he also contributed some of his best stories to the New England Magazine, The Knickerbocker, and the Democratic Review. It was a part of these magazine stories which he collected and published in 1837 in the volume entitled, Twice Told Tales, embodying the fruits of his twelve years' labor. This book stamped the author as a man of stronger imagination and deeper insight into human nature than Washington Irving evinced in his famous sketches of the Hudson or Cooper in his frontier stories, for delightful as was Irving's writings and vivid as were Cooper's pictures, it was plain to be seen that Hawthorne had a richer style and a firmer grasp of the art of fiction than either of them. Longfellow, the poet, reviewed the book with hearty commendation, and Poe predicted a brilliant future for the writer if he would abandon allegory. Thus encouraged, Hawthorne came out from his seclusion into the world again, and mixed once more with his fellow men. His friend, the historian, Bancroft, secured him a. position in the Custom House at Salem, in 1839, which he held for two years. This position he lost through political jobbery on a trumped-up charge. For a few months he then joined in the Brook Farm settlement; though he was never in sympathy with the movement; nor was he a be1iever in the transcendental notions of Emerson and his school. He remained a staunch Democrat in the midst of the Abolitionists. His notebooks were full of his discontent with the life at the Brook Farm. His observations of this enterprise took shape in the Blythedale Romance which is the only literary memorial of the association. The heroine of this novel was Margaret Fuller, under the name of Zenobia, and the description of the drowning of Zenobia—a fate which Margaret Fuller had met—is the most tragic passage in all the writings of the author. In 1842 Hawthorne married Miss Sophia Peabody—a most fortunate and happy marriage—and the young couple moved to Concord where they lived in the house known as the Old Manse, which had been built for Emerson's grandfather, and in which Emerson himself dwelt ten years. He chose for his study the same room in which the philosopher had written his famous book Nature. Hawthorne declares that the happiest period of his life were the four years spent in the Old Manse. While living there he collected another lot of miscellaneous stories and published them in 1845 as a second volume of Twice-Told Tales, and the next year came his Mosses from an Old Manse, being also a collection from his published writings. In 1846 a depleted income and larger demands of a growing family made it necessary for him to seek a business engagement. Through a friend he received an appointment as Surveyor of Customs at Salem, and again removed to the old town where he was born forty-two years before. It was during his engagement here, from 1846 to 1849, that he planned and wrote his famous book The Scarlet Letter, which was published in 1850. A broader experience is needed to compose a full-grown novel than to sketch a short tale. Scott was more than fifty when he published Waverly. Cooper wrote the Spy when thirty-three. Thackeray, the author of Vanity Fair, was almost forty when he finished that work. Adam Bede appeared when George Elliot was in her fortieth year; and The Scarlet Letter, greater than them all, did not appear until 1850, when its author was in his forty-seventh year. All critics readily agree that this romance is the masterpiece in American fiction. The only novel in the United States that can be compared with it is Mrs. Stowe's Uncle Tom's Cabin, and, as a study of a type of life—Puritan life in New England—The Scarlet Letter is superior to Mrs. Stowe's immortal work. One-half a century had passed since The Scarlet Letter was written; but it stands today more popular than ever before. Enumerated briefly, the books written by Hawthorne in the order of their publication are as follows: Fanshawe, a novel (1826), suppressed by the author; Twice-Told Tales (1837), a collection of magazine stories; Twice-Told Tales (second volume, 1845); Mosses from an Old Manse (1846), written while he lived at the Old Manse; The Scarlet Letter (1850), his greatest book; The House of Seven Gables (1851), written while he lived at Lenox, Massachusetts; The Wonder Book (1851), a volume of classic stories for children; The Blythedale Romance (1852); Life of Franklin Pierce (1852), which was written to assist his friend Pierce, who was running for President of the United States; Tanglewood Tales (1853), another work for children, continuing the classic legends of his Wonder Book, reciting the adventures of those who went forth to seek the Golden Fleece, to explore the labyrinth of the Minotaur and sow the Dragon's Teeth. Pierce was elected President in 1853 and rewarded Hawthorne by appointing him Consul to Liverpool. This position he filled for four years and afterwards spent three years in traveling on the Continent, during which time he gathered material for the greatest of his books—next to The Scarlet Letter—entitled The Marble Faun, which was brought out in England in 1860, and the same year Mr. Hawthorne returned to America and spent the remainder of his life at The Wayside in Concord. During his residence here he wrote for the Atlantic Monthly the papers which were collected and published in 1863 under the title of Our Old Home. The noble wife, who had been the inspiration and practical stimulus of the great romancer, survived her distinguished husband nearly seven years. She died in London, aged sixty, February 26, 1871, and was buried in Kensal Green Cemetery, near the grave of Leigh Hunt.